Sometimes the classic is what you need. Classics have this undenied comfort that makes you feel right at home. It warms your soul and melts your heart. So today is about going back to classics. No fancy ingredients, no fancy techniques. Just simple and comforting. Pineapple Upside Down Cake is just that. Preheat your oven to 350 degrees. Place 2 tablespoons of butter in a 9″ round cake pan and let it melt in the preheating oven. Add brown sugar and 1 tablespoon of water. Stir. Add pineapple and arrange as desired in the pan. I made sure that the edges are lined with pineapple pieces and the rest was spread in the center. In a large mixing bowl, whisk together the dry ingredients ( flour, sugar and baking powder ). I used my standing mixer’s bowl and whisked it on the lowest speed. Add the wet ingredients ( milk, butter, egg and vanilla extract ) and mix it all on low speed until combined. Beat the batter on medium speed for about a minute. Pour the batter over the pineapple pieces. Gently spread it around. Bake the cake for 30 – 35 minutes or until the toothpick inserted near the center of the cake comes out clean. My cake was done at 32 minutes. Let the cake cool for 5 minutes before inverting onto a plate. Some classics are always so yumm…this looks fab. Classics are the best. Simplicity and comfort at its best. Your pineapple upside down cakes looks amazing and is perfect for summer! I think my favorite classic pie is banana cream pie!!! I agree sometimes simple is the best. Your pineapple upside down cake looks amazing. I need to make a pinapple upside down cake someday…it sounds delicious! Yours looks scrumptious! 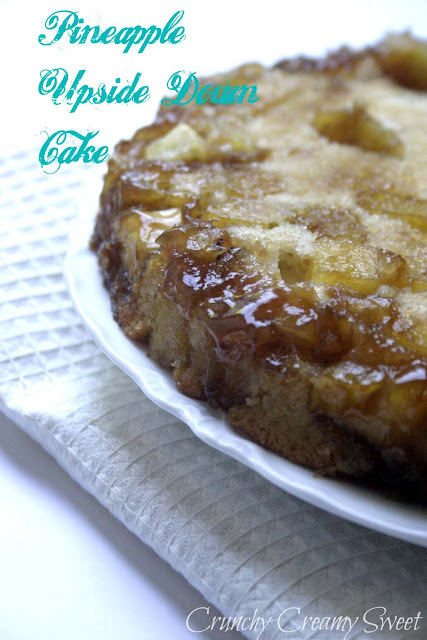 Nothing wrong with simple classic – Love pineapple upside down cake. Yum! I agree. Sometimes a simple classic is the best way to go! Yum! i love pineapple upside down cake – yours looks gorgeous! Love classics! This looks to die for! Oh my, that looks amazing! I have never made this kind of cake before- I think it's time I do it! It looks so caramely and delicious! Oh this looks so good. I just happen to have a fresh pineapple in my fruit bowl right now. I tend to do apple crisp when I want simple. Look delicious I love classic recipes; I love classic lemon pie!! Pineapple upside down cake is one of my favourites too! Totally agree with you that it is a classic. Your recipe is from a Bridal edition of BHG…no wonder, it looks so elegant. This is proof that we can be satisfied with something that is not chocolate. I love pineapple and there is something about the cake part in an upside down cake that is so unique and tasty-it is hard to pass up! You picture here does have me wanting some! Ha-your cake was done at 32 minutes, but here it would be eaten faster than that! Have a great afternoon! Looks amazing! I love pineapple upside down cake, I swear it was the first cake I ever learned how to make from scratch. I can't remember the last time I made one or had any and now I want some. YUM! Yum! One of my favorites! I need a slice and a cup of coffee! Deliciousness!